After starting on the pole and not yet winning a race, Friesen was looking for his first career win today at Martinsville Speedway. He remained steady by finishing second in Stage 1 but dropped a few spots, finishing fourth in Stage 2. Friesen led twice for 18 laps, however, it was a quiet day for the No. 52 Halmar Racing Team as they wound up fifth for Stewart’s second top five of the season and the 13th of his career. He also bettered his Martinsville finish from one year ago, where Friesen finished 20th that day after starting fifth. It was also his best Martinsville finish of his career this far. For Ross Chastain, the same story could be said, but just a higher finish than Friesen. At some points, it looked like he could win but late race cautions and Busch having the better truck ultimately cost him. 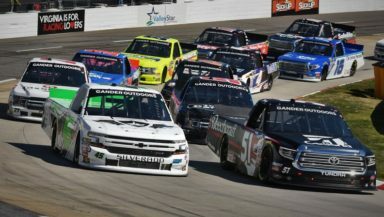 Still, Chastain has been on a roll this season finishing third at Daytona, sixth at Atlanta, 10th at Las Vegas, and following it up today with a fourth-place finish at Martinsville. It’s his best ever finish and the second top five of the young 2019 season. Chastain finished fifth in Stage 1 and won Stage 2, ultimately finishing fourth after leading twice for 53 laps.